Better suited to the PSone console than gracing the PS2, Sunny Garcia is a title that promised so much and yet failed to deliver on many counts. Still, any improvement on Surfing H30 is a good thing and this it does - barely. With big names behind him in the industry, Sunny Garcia makes his way into the console market with hardly a splash. Graphically the game fails to impress with the only difference between the PSone and PS2 being the anti aliasing of the water. Waves are generated fairly unrealistically and the backdrop of the surf locations is generally just a photo slapped on the background - by all appearances in any case. The title does feature a bit of replayability and the music featured may keep you in front of the game a bit longer as well. Reward titles on the screen are so small and in such a basic font it doesn't really challenge you to try harder to learn new tricks. The total lack of features comes as a surprise with the game's release date pulled back a few months. For skegs (surfers) out there, this title may keep you happy until Kelly Slater Pro Surfer comes out as it is an OK title to play. For the rest of us, it will be a serious case of hit and miss. 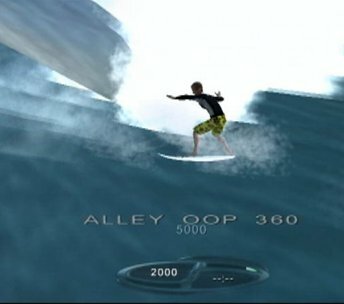 There is a "surf school" option but all it is, is a series of diagrams showing how the tricks are performed, as compared to Tony Hawk Pro Skater 3 where the Birdman himself talks you through each trick and you get to try it out. Sunny Garcia Surfing is a tough one to conclusively condemn or praise with pros and cons almost matching up. Give it a try for yourself and let me know what you think. Personally, this is one that I most likely would not pick up again and I hope that Krome studios learn from this title as I would be most interested in seeing Sunny Garcia Surfing 2.